This winter has been cold. Heck, Windsor and Sarnia set new cold weather records, breaking the previous record set in 1950, according to the CBC. Likewise, Toronto set a new low-temperature record this winter, beating their previous record set in 1960. The season can be tough on us, but it’s equally tough on our homes. Cold air, heavy snow, high winds, dramatic drops in temperatures, all affect your house. Here are three major threats Canadian winters can pose to your home. Water damage and flooding is nothing new. We have all heard stories about a flooded basement, haven’t we? One of the primary causes of basement flooding is from a sewer backup. Well, your pipes tend to get frozen during wintertime. Damage from frozen pipes is a common issue for homeowners across Canada. Low temperatures cause the water in the pipes to freeze. As the water freezes into ice, it expands causing the pipes to rupture. Result: severe water damage can occur once the ice starts to melt. Each year, Canada sees approximately 24,000 house fires. Wow! And let’s not forget about the hundreds of millions of dollars in damages. The risk for fire increases during colder months as Canadians spend more time at home. Most Canadians do not use traditional wood stoves, but there are still other heat sources that can lead to fire when left unattended or not properly maintained. For example, you have guests over for the holidays and become distracted talking to them leaving your cooking unattended. This is how most kitchen fires take place. Take Note: holidays are one of the worst times for house fires. Keep your Christmas tree and decorations away from all heat sources and do not place candles on or near a tree. If you do, it could result in spreading some unwanted magic. If you take public transit or walk to work, you might have noticed stronger winds this winter. Canada is no stranger to high winds during colder months. No, Canada does not fall under a “hurricane zone”, but that doesn’t mean the winds we face aren’t capable of causing damage, especially when combined with ice and snow. The weight of snow can be hard on your roof, while ice storms can damage structures or take off tree limbs and plant them through a window. 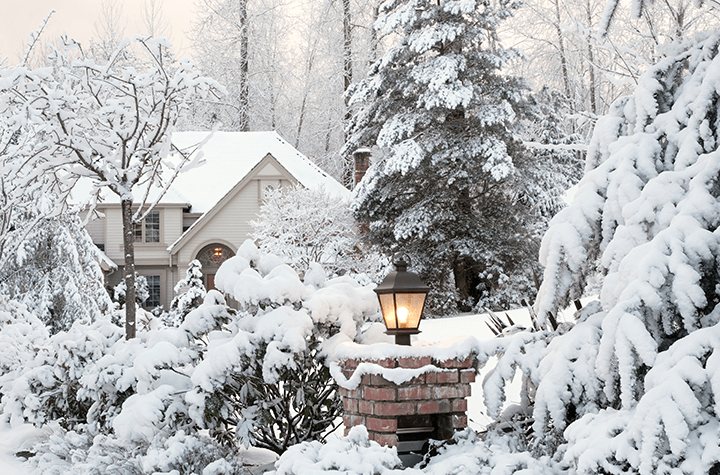 Winter’s elements can be tough, and they can lead to some pretty serious damage to a house. The three threats to your home discussed above can drown you if you don’t have adequate home insurance. The New Year is a great opportunity to take a look at your policy and see whether you are properly covered.